Preheat the oven to 350º F. Take a small bowl and pour the soy milk and the vinegar in it, and let it curdle on the side while you combine the dry ingredients in a medium bowl. (Sift together flour, cornstarch, baking powder, baking soda, and salt.) Now get out a LARGE bowl and cream the vegan butter/margarine and the sugar together. You can use an electric mixer if you want, but I just hand-beat it until it's fluffy. Beat in the extract too when you're done. Then you want to alternate between mixing in splashes of the vinegar/milk mix and the flour mix. It should be a not-very-thick cupcake batter at the end, and there should be no lumps. 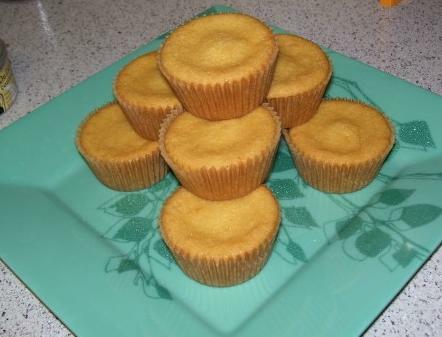 Line a cupcake tin with papers, fill each cup to 2/3 full, and stick the pan in the oven for 20 to 22 minutes. Cool on a rack. If you're going to frost these, you need to let them cool completely before you do. Note: Obviously this can be made without the vegan substitutions; you can use regular butter, and real milk instead of soy. However, you might as well just use another recipe if you're going to do that. The recipe book I got it from calls these "Golden Vanilla Cupcakes" and it also offers an alternate for the vegan butter: Use 1/3 cup canola oil instead of the butter entirely. If you do that, you need to change how you make them, though: Put the oil in the soy milk/vinegar mix, and put in the extracts and the sugar. Then sift in the flour mixture. Add an extra 1/4 teaspoon of salt (in addition to the 1/4 teaspoon already in there) if you're using the oil. They also suggest that as a variation you can leave out the almond extract and just add in more vanilla, or even use caramel extract.